The wellness revolution in senior living is here to stay, and much of it is powered by technology. In a senior living context, wellness focuses on five main components: the emotional, mental, physical, social and spiritual. Technology touches each of these elements. 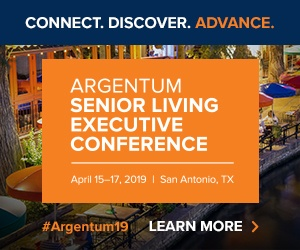 To compete in the next decade and beyond, senior living providers must understand what wellness means for their residents, why their residents are demanding it and how technology can deliver it. Here are three wellness tech initiatives that providers must deliver if they want to remain competitive. In the last year, Big Rock Senior Housing of Delray Beach, Florida, opened two senior living communities in Florida. In the last year, according to Vice President of Operations Sean Nealon, both of those communities became technologically outdated. That’s because while they incorporate lots of smart technologies, they aren’t yet smart communities. It’s time for senior living providers to go all in on this technology. Like every other area of life, wellness is becoming smart. Beds, canes, clothes, flooring, lights, scales, silverware, toilets, window panes — all of these items come with “smart” versions, joining the ubiquitous smartphone and the ever-more-common smart TV as standards in American life. Wellness-centered smart rooms are the next step, with technology that will guide a resident’s entire interaction with his or her physical surroundings. Big Rock’s next four communities, breaking this year and next, will be fully smart. The Amazon Alexa system will be built into the walls and ceilings, thus making all of the apartments fully voice-activated. That’s music to Amazon’s ears: in May 2018, CNBC learned via an internal Amazon document that the tech giant has built a team within its Alexa division called “health & wellness.” The team’s job will be to tailor Amazon Echo speakers and the Alexa voice assistant to the health care sector, making it easier for senior living providers to outfit resident rooms — and later, full communities — with smart technology. Until then, forward-thinking senior living providers, including Big Rock, are working on smart rooms. New Jersey-based Juniper Communities, for instance, has two communities with smart suites already in use. They utilize several smart elements, including door locks, lights, thermostats and television. “It’s pretty customizable to whatever the resident would want and need,” says Vickie Stotler-Smith, national director of sales and marketing at Juniper, which offers the full continuum of care across its portfolio. Depending on the options the resident wants, the rooms cost $1,000 for Juniper to develop, though that is just for the supplies within the room, not the infrastructure. Juniper is exploring both Amazon Alexa and Google Home as the in-room personal assistants. Depending on the options the resident wants, the rooms cost $1,000 for Juniper to develop, though that is just for the supplies within the room, not the infrastructure. Juniper is exploring both Amazon Alexa and Google Home as the in-room personal assistants. Whether smart rooms or smart communities, the modern wellness environment brings technological requirements. Namely: community-wide, enterprise-grade Wi-Fi. Installing a technological backbone that lets residents and staff easily use their smart devices anywhere on campus, therefore, is a non-negotiable of the modern senior living community. This technological backbone has two components. The first is cabling that facilitates wireless coverage. The second is campus cellular service. These two elements — the Wi-Fi and the cellular — lay the groundwork for potentially the next 10 years of technological innovations, and help facilitate not just smart units but smart communities. The older of Big Rock’s two communities is Villages of Windsor in Boynton Beach, Florida, a 22-acre CCRC managed by Atria Senior Living. Nealon estimates that for a community this size, a comprehensive technological backbone costs roughly $1 million: about $450,000 for the cellular and $200,000 to $300,000 for the cabling. Micah Smith is the services account executive out of the Atlanta office of Pivot Technologies Solutions, and currently works with Big Rock on all technology areas. To Smith, the key advantage in building the technological backbone is adaption time for future technologies. If a community that lacks the comprehensive backbone wants to embed Alexa into the walls, or add some yet-to-be-imagined wellnesscentered technology that might crop up in the next 10 years, that process could take months, Smith says. Big Rock, he says, could do it within 24 to 48 hours. Once the technological backbone is down, the wellness technology possibilities are endless. New technologies are delivering health, safety and entertainment to seniors, with endlessly creative applications. Big Rock’s Villages of Windsor, for instance, all equipment in the fitness room is from New Jersey-based Technogym, equipment that collects health and fitness-related data during a resident’s workouts and then automatically shares the data with the resident’s personal trainers. In Vista, California, luxury resort and wellness spa Cal-a-Vie uses all sorts of tech tools to deliver wellness to guests, including a brain-sensing headband called Muse. The headband is equipped with electroencephalogram, or EEG, sensors that detect brain activity and serve as a biofeedback tool. The user wears the headband while meditating, along with headphones, all of which attach to a handheld device. The sensors read the user’s brain activity during meditation and translate them into sound, which the user hears through the headphones. When the user is calm and relaxed, the sound is pleasurable. When they are anxious or restless, it is not. They can then use those sounds to redirect their own meditation efforts to help calm themselves. Cal-a-Vie’s nutritional director introduced it because stress can cause overeating. These new experiences are now being developed specifically for seniors, aimed at helping the aging population solve problems of lack of mobility and increased isolation. Kyle Rand co-founded VR expedition platform Rendever after watching his grandmother deteriorate mentally and physically when she moved into senior living following a second cancer diagnosis. A developer by trade, Rand set out to help energize and activate seniors stuck in their senior living rooms. During his team’s research, they learned about the strong correlation between social isolation and both depression and cognitive decline. Further, they found that there was as high as a 50% rate of reported isolation in senior living communities. He now develops and sells virtual reality platforms focused on delivering both group and individual experiences to seniors. These experiences have multiple benefits for seniors. They let them visit places they could never otherwise go, or places where they have not been in decades. And they let them share these experiences with their fellow residents, sparking conversation, nostalgia and the deep bonds forged with travel and shared experiences. “We look at VR as this amazing, innovative technology, but that initially was only used for gaming, for kids — things that don’t necessarily focus on social good,” Rand says. Click here to access the complete report, which digs deep into the wellness initiatives shaking up senior living, and reveals what senior housing leaders need to do to remain cutting edge.